The film opens with a re-run of the ending of Hammer’s original 1958 film, with an added narration by Andrew Keir, in which Christopher Lee is destroyed by Peter Cushing. The action then moves forward ten years, as brothers Charles and Alan Kent, with their wives Diana and Helen, are holidaying in the Carpathians. Deserted in a remote forest by a superstitious coachman who will go no further at night, they are rescued by a driver-less coach and horses and taken to Castle Dracula. There they meet Klove, Dracula’s manservant, who explains that, although his master is dead, he left instructions that the castle always be ready to receive guests. Later that night, Alan is lured by Klove from his bedroom down into the vaults of the castle, where a ghastly fate awaits him…..
Christopher Lee speaks not a single word of dialogue in this film. On its release, Hammer’s publicity people sought to explain this as a deliberate decision to make the Count more sinister. Years later, however, it emerged that Dracula’s silence came about as a suggestion from Lee himself, who was of the opinion that he would do better saying nothing rather than having to utter the appalling lines he had been given in the script, which, it also transpired, had been written after all by none other than Jimmy Sangster using the pseudonym John Sansom! 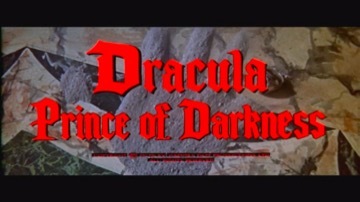 The script also seems to have had problems with the British censor and the scene in which Klove’s unfortunate victim provides the blood for Dracula’s resurrection had to be toned down. Instead of decapitating him, as originally written, Klove merely slits his throat instead! In order to reduce production costs, four films were made back to back at this time, using virtually the same sets, production staff and cast. The other three were “The Plague of the Zombies”, “Rasputin – the Mad Monk” and “The Reptile” (all 1966).